Nutrient Dense Spicy Quinoa Recipe. Adopting a more plant based diet is a goal of many, but it can be tough to know where to start. Vegan food doesn’t have to be bland and tasteless. On the contrary, vegan food can be some of the most flavorful food you’ve ever tasted. By utilizing the intensity of herbs and spices, you can ramp up the satisfaction and flavor profile of any dish. This can especially be true in regards to preparing seeds and grains that are virtually tasteless by themselves. Quinoa is different from grains like rice and oats in that it actually is categorized as a complete protein. It is one of the few plant foods that containing all nine essential amino acids. Although quinoa is commonly included in the same conversation as grains, it is botanically more like spinach. Actually it is the seed from a flowering plant. This unique seed is typically prepared by boiling in combination with water, similar to the preparation commonly used to cook rice. Quinoa can be served a sweet or savory dish, and can serve as a snack, side or a foundation of a dish. 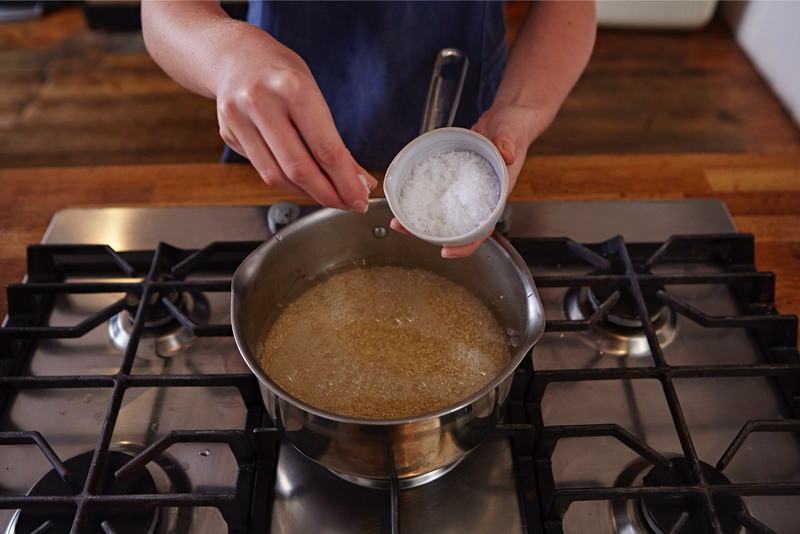 Sweeter quinoa dishes can be made with ingredients like cinnamon and pure maple syrup, while savory dishes can be made with ingredients like black pepper and onions. You could even add quinoa into your morning bowl of oats for some added protein and diversity. Add optional items such as avocado, shredded carrots, broccoli, mushroom and cauliflower. Other ideas include dried fruit, more seeds (sunflower, sesame, poppy seeds) and nuts (macadamia, almonds, cashews, brazil nuts). 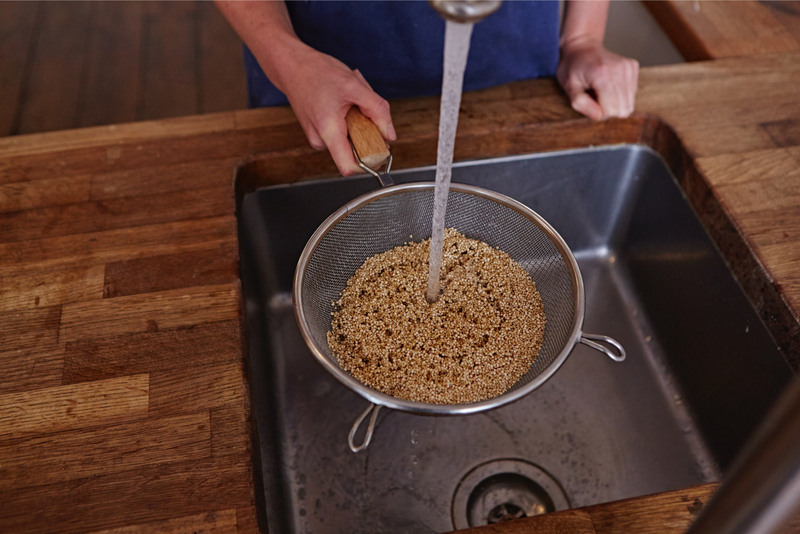 Using a large measuring cup, scoop 3 cups of quinoa into a large saucepan. Make sure you’ve got plenty of room to combine all of your ingredients when you take the quinoa off the heat. Pour the 4.5 cups of water in with the quinoa. Turn your stove top on high heat. 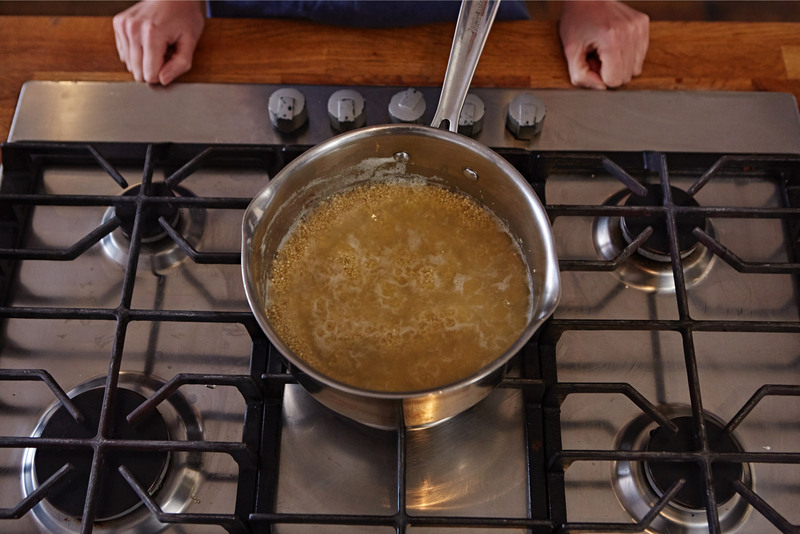 Cover your saucepan with a lid and bring the quinoa to a boil. When the quinoa comes to a roaring boil, reduce the heat to a simmer and continue to cook with the lid on for 15 minutes. Feel free to peak on your quinoa at the 10 minutes mark to see how much water it has absorbed. Ideally, at the 15 minutes mark, the quinoa will have absorbed all of the water and will appear light and fluffy (similar to rice). Adjust this time as necessary, as every stove top is slightly different. After your quinoa has simmered for approximately 15 minutes, take the lid off and stir with large cooking spatula or spoon. You want to add your wet ingredients to the quinoa first, while it’s hot. This will make it easier for them to combine thoroughly. Pour ¼ cup of your favorite hot sauce into the quinoa, along with 3 tablespoons of olive oil. Stir adequately until they are evenly coating the quinoa. After the wet ingredients are combined, it’s time to add in the dry ingredients. Using your large spatula or kitchen spoon, stir in ½ cup of pumpkin seeds, liberal pinch of sea salt and a hefty sprinkling of pepper. Sea salt and pepper measurements are up to, add them in to taste. For a starting point, aim for a teaspoon of each and work up from there. A great way to add in some additional nutrition is to pick some favorite veggies and add them into the mix. Some ingredients that work well in a quinoa bowl are avocado, shredded carrots, broccoli, mushroom and cauliflower. More ideas on potential add ins include dried fruit, other seeds (sunflower, sesame, poppy), and nuts (macadamia, almonds, cashews, Brazil nuts). If you do not care for hot sauce, you could opt for a marinara sauce to keep the flavor but omit the heat. Substituting in a pesto sauce is a practical swap as well (traditionally made with olive oil, garlic, basil and pine nuts). After you’ve reached your desired flavor with your seasonings and toppings, it’s time to eat! 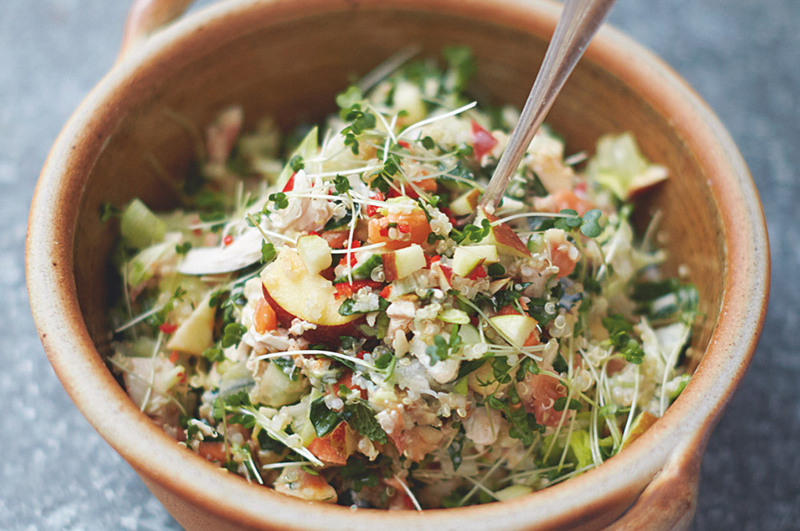 Indulge in your nourishing serving of quinoa by spooning each serving into a dinner bowl. Add some fresh herbs like thyme or basil to the top of your bowl for a pop of freshness. Fresh citrus is another way to make your final product pop. You’re likely to find that this dish has plenty of flavor as is, though! The simple combination of hot sauce, sea salt and pepper elevate the flavor of the quinoa and make for a filling, mouth-watering dish that your whole family and array of guests will love. There is a multitude of variations on how you can prepare quinoa – this version just packs some added healthy fats and spicy flavor for additional satisfaction. To read more about the health benefits of adding healthy plant based fats into your dishes, check out this feature on 15 Health Benefits of Pumpkin. Have you prepared quinoa before? If so, what is your favorite way to prepare it? Tell us in the comments below! This vegan, gluten free, dairy free, filling dish lends itself to a lot of creativity and easy alterations. There are so many possibilities for additional ingredients or healthy swaps for you to cater this meal so that it adheres to your diet and doesn’t aggravate any food sensitivities/allergies. For example, olive oil can easily be replaced with coconut oil, grass fed butter, grape seed oil, macadamia nut oil, etc. Let your mind run wild and be creative with this meal. Look to rely on this recipe for potlucks, nights entertaining a crowd at your house, family dinners and even on food-prep Sunday. The great thing about this recipe is that it can be tweaked and is not easily messed up. Don’t fret if your measurements are not spot on. You can always add more water or more quinoa during the cooking process if the texture is not ideal. Quinoa Breakfast – a good start of your day. A quinoa breakfast gets you going. Place the quinoa in a fine sieve and place the sieve in a large bowl. Then cover the quinoa with water. Use your hands and rub the grains together for 30 seconds. Then rinse and drain the quinoa. Repeat this procedure twice. Drain the quinoa well and combine it with the coconut milk, 2 tablespoons of water, brown sugar and salt in a medium saucepan and bring it to a boil. Reduce the heat and simmer for 15 minutes or until the liquid is absorbed, while stirring occasionally. Stir the mixture constantly during the last 2 minutes of cooking. 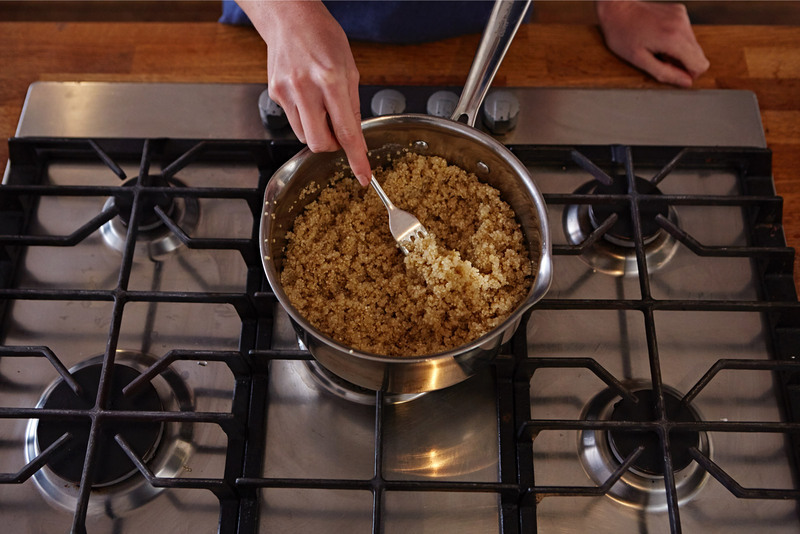 While quinoa cooks, spread flaked coconut in a single layer on a baking sheet. Bake at 400° for 5 minutes or until golden brown. Cool slightly. Place about 1/2 cup quinoa mixture in each of 4 bowls. Top each serving with 1/4 cup strawberry slices, 1/4 cup banana slices, and 1 tablespoon toasted coconut. Serve it warm. Like most whole grains, quinoa is surprisingly filling, but if you need more for breakfast, serve with an egg on the side. We wish you a bon appetit and an awesome day ! Author Peter de LeeuwPosted on 15th April 2017 15th April 2017 Format ImageCategories Blog, RecipesTags biogrown, bioshop, domainelion, health, healthfood, healthy, marrakech, marrs, morocco, protein, weightloss, wellnessLeave a comment on Quinoa Breakfast – a good start of your day. Antioxidants are especially important in keeping our skin healthy. The antioxidant benefits of vitamins C and E are well known, but the importance of the trace mineral zinc has been overlooked. The International Journal of Dermatology found that zinc has the supporting antioxidant role in protecting against free radical–induced oxidative damage. Zinc protects against UV radiation and enhances wound healing. The study concluded that topical zinc ions may provide an important and helpful antioxidant defense for the skin. In addition, it contributes to immune and neuropsychiatric functions and decreases the relative risk of cancer and cardiovascular disease. Zinc is called an “essential trace element” because very small amounts of zinc are necessary for human health. One cup of quinoa contains 13% of the RDA, which makes it one of the best sources of zinc. Zinc is used for treatment and prevention of zinc deficiency and its consequences, including how it affects the skin and liver disease. and the YIELD: 8 servings. In a large saucepan, bring water to a boil. Add quinoa. Reduce heat; simmer, covered, 12-15 minutes or until liquid is absorbed. Remove from heat; fluff with a fork. Transfer to a large bowl; cool completely. Stir spinach, tomatoes, cucumber, peppers and green onions into quinoa. In a small bowl, whisk dressing ingredients until blended. Drizzle over quinoa mixture; toss to coat. Refrigerate until serving. 3/4 cup: 143 calories, 5g fat (1g saturated fat), 0 cholesterol, 88mg sodium, 23g carbohydrate (6g sugars, 3g fiber), 4g protein. Diabetic Exchanges: 1 starch, 1 vegetable, 1 fat. Enjoy your tasteful Quinoa Salad.